We love when clients allow us to explore our more contemporary impulses. 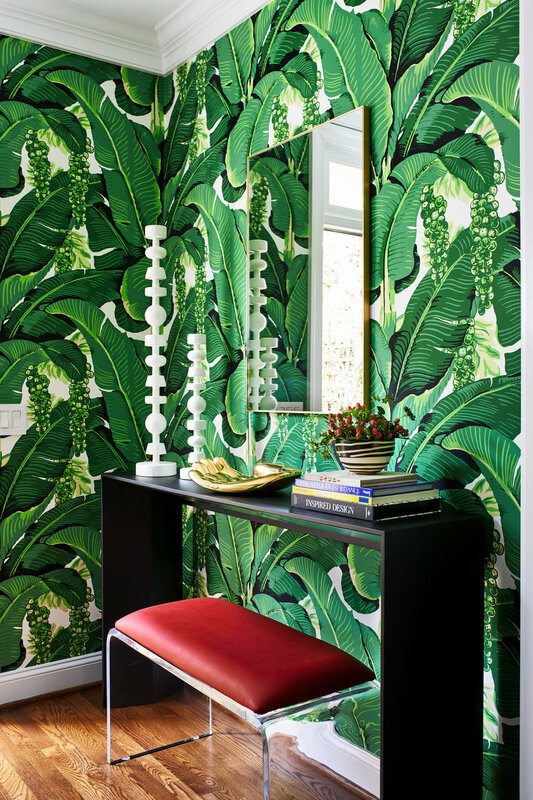 Here, the homeowners wanted a clean but bold aesthetic, accomplished right out of the gate with a playful Dorothy Draper paper adorning the entryway walls. We added graphic layers with a vintage console and bench. The living room is where shapes, angles and colors do their job in creating an understated yet impactful setting. A long-legged bar cabinet opens to expose a custom painted high-gloss yellow interior—an unexpected pop to a vintage mid-century piece. The three-ball-based coffee table centers the dynamic seating area, comprised of a linen rolled daybed, pink mohair velvet Warren Platner chair and a low-slung sofa. Taken altogether, the room blends bold lines with mid-century design.